Rocky Forge Blacksmith Guild meetings are usually held on the second Saturday of each month. (Check the events calendar to make sure.) Regular meetings begin at 9:00 A.M. with a business meeting, frequently followed by blacksmithing demonstrations, and then forge time for everyone. We have taken to holding a potluck lunch sometime around noon. Winter meetings are different. Since our current facilities are mostly outdoors, the cold weather makes blacksmithing considerably less enjoyable. 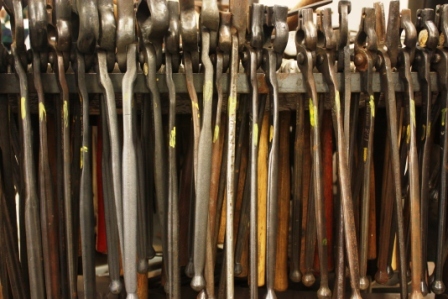 Therefore, we arrange for blacksmithing-related meetings, such as visiting welding shops and steel plants. Alternately, we may arrange for a demonstration of some interesting technique, method, or equipment. Regular meetings are held at the home of one of our members. Contact us for directions and information. Winter meetings are held at the locations specified in the events calendar.